It is with our deepest sorrow that we inform you of the death of our beloved husband, father, and grandfather William “Pops, Willwill, Danny, Best Man” David Daniel, of St. Thomas, USVI. 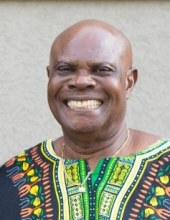 He was born on June 6, 1947 in Nevis to the late Jane Elizabeth James-Daniel and the late Oliver Daniel, and passed away at the age of 71 on January 13, 2019 in Akron, Ohio. William was the beloved husband of Rosetta Daniel for 46 years. He was a great father to his 6 children, Heather (Leonard) Govia, Roy (Tanzania) Daniel, Devon Daniel, and Dayne (AnnMarie) Hawkins, Denise (Hena) Pelima, and Debbie Spencer. He was a loving grandfather to Iesha Govia (deceased), Kiana Govia, Kedar Daniel, Kaleb Daniel, Devon Daniel Jr, Amanda Hawkins, Sando Pelima, and Varney Pelima; was a cherished brother to Virginia (Robert) James-Matthews (deceased), Veronica Daniel-Grant, Irwin (Babelyn) James (deceased), James (Vida) Daniel, Charles Daniel (deceased), Anna Daniel-Palmer, Sylvie (James) Daniel-Dean, Margaret Daniel, Ruby Daniel, Ideta Daniel-Palmer, St. Clair Daniel, and Thelma Daniel; was a wonderful brother-In-law to Bernice Phillip, Sylvie (Ira) Ward, David Phillip, Eddie Phillip, and Paulette (George) Shepard. He was a delightful Uncle to numerous nieces and nephews, and a Life-long friend to many. Pops was hardworking and determined to provide opportunities for his family to live a better life. He was a great provider to us; many long days and years working multiple jobs. Hitch hiking from one to the other before acquiring his own vehicle. Even vacation from one was a time to take up another assignment. Indeed, we are better today because of him. He spent 43 years with Frenchman's Reef Marriott Resort, St. Thomas, USVI. He worked in multiple departments, where he was well known and admired. He spent much of the last 20 plus years enjoying visiting his children and sharing his wisdom with his grandchildren. Our Dear Pops was a formative domino player and a sports enthusiast. Passionate about his favorite teams, be it the Dodgers, New York Yankees, Los Angeles Lakers, and the Pittsburgh Steelers. Even in the mist of enemy territory he would show his team colors. Daring to attend a Cleveland Indians game wearing a New York Yankee’s hat. He was not un-noticed…yes, he was fearless! Special thanks to the wonderful doctors and nurses at Summa Health and to many who provided invaluable care and prayer to our dearly departed. Friends and family can pay their respects at the wake on Friday, February 1st from 5:00p.m. to 7:00 p.m. at the Celestial Chapel of Dan Hurley Home for Funerals. The second viewing will take place on Saturday, February 2nd from 9:00a.m. to 10:00 a.m. at St. Thomas Assembly of God, #133 Contant, St. Thomas, 00802. The funeral service, officiated by Pastor George E. Phillips, begins at 10:00 a.m. at St. Thomas Assembly of God. Interment will follow at Smith Bay Eastern Cemetery, 8 Smith Bay Rd, Smith Bay, St Thomas 00802, USVI. Arrangements are under the care of Dan Hurley Home for Funerals and Cremation Center of St. Thomas, St. John and St. Croix. To plant a tree in memory of William David Daniel, please visit our Tribute Store. "Email Address" would like to share the life celebration of William David Daniel. Click on the "link" to go to share a favorite memory or leave a condolence message for the family.